Adventure #260 (May 1959) - How Aquaman Got His Powers! To protect an undersea secret, Aquaman tells the story of his origin to a Navy Commander. Regular Supporting Cast: Atlanna, Tom Curry. Aqua-Exclamations: "Great Neptune! ", "Leaping Ladyfish!" Quotefile: Aquaman, "You must forget your orders, Commander! Please listen to me! I've got a story to tell you... about me! It's been a dead secret... till now! It concerns my childhood... and how I got my powers!" Finny Friends Report: On the splash page, young Arthur is threatened by swordfish. 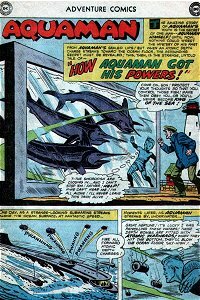 Aquaman has electric eels jam the depth bomb signals, then has whales slow the bombs down while he disarms them. Baby Arthur plays with turtles and sharks. Tom builds a tank and stocks it with swordfish, which threaten young Arthur as on the splash page. Arthur learns how to control them. In order to free a trapped squid, Aquaman summons octopi to row the wreck of a Roman galley off the squid. The fish pledge obedience to Arthur. Aquaman tries to get a whale to help a stranded ferry and learns that whales won't enter fresh water. This is the first time that Aquaman is given a proper name. Until this story, he was ONLY Aquaman. We also know his parents' names: Tom Curry and Atlanna. Aquaman's mother died when he was just a child. His father died when Arthur was already an adult (and was buried at sea with a United States flag-draped casket). So, this is it. The beginning of the Silver Age as far as most people are concerned. This is when Aquaman's origin changes from being the son of a scientist who learned the secrets of Atlantis to being the son of a lighthouse keeper and an Atlantean exile. This is not the first appearance of Atlantis in the strip, not even the first appearance of living Atlanteans, but it's quite a turning point anyway. Now, there are two good ways to get this story without hunting down the original Adventure Comics. The first is the Aquaman Archives from 2003. This has the story better than it looked originally, with exactingly recreated colors. It is a truly fantastic reprint, though the price may be a bit hefty for the casual Aquaman fan. A less impressive but much cheaper reprint is in Showcase Presents: Aquaman Vol 1. The story is better (IMHO) in color, but the B&W reprint is a good way to get the story. The bonus with both these methods of getting the story is that there are plenty of other stories in each book, and both are in print from DC Comics right now. This story(with a few slight revisions)remains the definitive version of Aquaman's origin where I'm concerned.